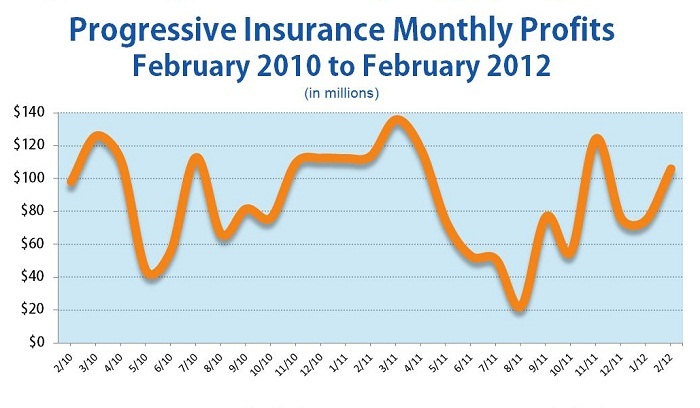 Progressive Insurance posted significant profit gains between January and February 2012, but the insurer’s monthly profits were down compared with February 2011, according to financial data released by the company on Wednesday. The company had about $1.379 billion worth of written premiums last month. February 2012 brought $106.3 million in profit for the company, up 41 percent from the month before. Total revenues actually dropped 17 percent during that period, but that was offset by a decline in the total cost of paying claims, acquiring policies and underwriting. The combined cost of those categories fell $304.3 million, or 22 percent, between January and February. Improvement in performance of the company’s securities also helped buoy the numbers. Security gains went from $11.9 million in January to $29.4 million in February, an increase of about 158 percent. Compared with February of last year, February 2012 results were down slightly, but it was still a relatively good month for the direct-to-consumer insurance company. Total monthly revenues were up $63.5 million, or 5.3 percent, but those gains were wiped out by higher claims, policy acquisition and underwriting costs. The total cost of those operations was up $74.4 million, or 7.3 percent. In the end, the company’s February profits fell by $7.8 million, a drop of 6.8 percent. According to data released this month by the National Association of Insurance Commissioners (NAIC), Progressive is currently the fourth-largest private passenger auto insurer in the country, in terms of market share. The company got to that point by maximizing the potential of direct-to-consumer sales, in which Progressive consumers buy insurance online or over the phone instead of having to go through an agent. Progressive’s latest data show about 46 percent of the company’s auto policies are sold to drivers through direct means. NAIC data show that the company has written about $13.42 billion worth of car insurance premiums, which gives it an overall 7.94 percent share of that market. About 70 percent of the company’s policies are for car coverage. The only companies ahead of Progressive for auto coverage sales are Geico, Allstate and State Farm. To read the experiences of current and former Progressive policyholders, readers can find user-submitted Progressive auto insurance reviews online.